« Mining Menace: Could New EU Rules Put Data in Danger? It’s begun! 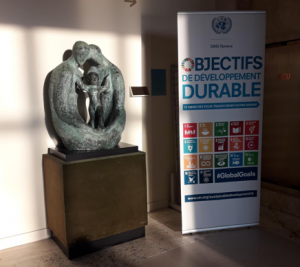 The UNECE Regional Forum on Sustainable Development is the first in a series of five, focusing both on delivering the 2030 Agenda at the regional level, and preparing for 2018’s High Level Political Forum. It’s an opportunity for the key people involved in coordinating the Sustainable Development Goals (SDGs) from governments across Europe to come together and discuss how they are moving forwards. And it’s a chance for civil society organisations to build contacts and influence the message they will send to New York in July. IFLA is there. Day 0 focused on information-sharing, and creating statements to be delivered on behalf of all civil society in front of ministers the following day. For libraries, 2018 is an important year, given that SDG 11 – sustainable communities and cities – is on the agenda. This SDG is clearly a priority for many other civil society organisations too, given how many joined the group working on the relevant statement. Despite the potentially different focus of the representatives there – housing, older persons, youth, open government – there were two key points of consensus. Firstly that sustainable cities depend on the wellbeing and inclusion of all citizens. And secondly that for these citizens to be included, information plays an essential role, both in terms of getting and using statistics that help identify who may be falling behind, and in ensuring that everyone has access to information, technology and skills. A great opportunity to talk about the work of libraries in empowering all members of societies – especially the least well-off – through information! IFLA highlighted that public services – and libraries in particular – remained essential if we are to leave no-one behind, and that without their support, new digital technologies would not necessarily serve the wellbeing of all of the community. We’re looking forward to talking more with delegates today and tomorrow about how libraries can make the difference. Setting goals is meaningless unless there’s a way of checking on implementation. One tool for this included in the 2030 Agenda is Voluntary National Reviews (VNRs), where Member States present a report on the progress they are making in front of their peers at the High Level Political Forum. The Regional Meetings are a chance to update on progress on these. The civil society event brought together a number of NGOs already engaged in the VNR process. As the name suggests, these are voluntary, meaning that governments have a lot of space to work out how they are done. This was clear in the input from these NGOs. Some countries have formal platforms, giving civil society the opportunity to share views and meet with ministers and senior officials. Others take VNRs as an opportunity to advertise themselves. We’re working with IFLA members in countries which are undertaking VNRs this year to understand how far they are involved, and to offer support and advice where we can. At their best, this can be a great way to get libraries higher up the agenda, and to celebrate how our institutions are making a difference. More tomorrow from the first day of the formal meeting!